The Lift Plus Portable Stacker is an all-in-one stacker, transporter, positioner, and portable work bench that can help reduce injuries while improving productivity and decreasing product damage. The Lift Plus can lift up to 350 pounds with an all-metal frame platform and screw-driven lift that delivers smooth precision that hydraulics or chains cannot match. Because of its unique design, this stacker can be used in tight spaces other mechanical stackers can’t. Manufacturing and distribution facilities around the world are increasingly using tow vehicles and towable trailers to transport materials on the floor, allowing forklifts to focus on vertical movement (such as loading or unloading pallet racks. Battery powered tow vehicles, which can accommodate one or two people and tow up to 5,000 lbs. at 7 ½ to 11 mph, offer a less expensive, safer alternative to forklifts for heavy load movement. To achieve maximum productivity and return on investment, manufacturing and distribution facilities use industrial stock carrier towing vehicles to tow large loads of stock quickly and easily from place to place. These vehicles, able to carry a hefty 1,200 lb. load or pull up to 5,000 lbs. at a time, have a large deck and dual front wheels for carrying all kinds of things from parts to plants. Industrial burden carriers, ideal for warehouses, distribution centers, airports, manufacturing facilities, and even greenhouses, have a heavy load capacity and a sturdy 14-gauge diamond plate steel construction for durable performance. The spacious rear deck can carry loads up to 1,000 lbs. and the vehicles themselves can tow up to 5,000 lbs. and reach speeds of up to 11 mph (depending on the model). With the requirements for immediate maintenance in today’s factories and distribution centers greater than ever, maintenance personnel must be able to respond by getting the impacted area quickly with the necessary equipment and tools. 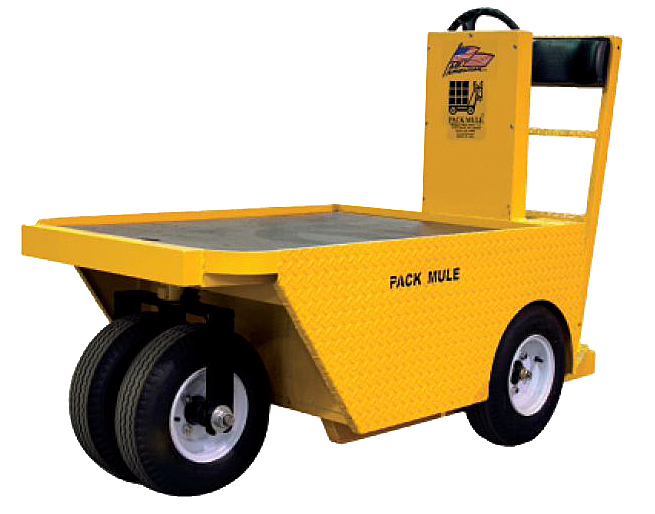 Industrial maintenance vehicles, which offer a roomy rear deck for carrying tools and supplies up to 1,000 lbs. and a towing capacity of 2,000 lbs., can quickly put manpower and tools where repairs are needed. The aluminum hand truck pallet rides on the nose plate of the hand truck, allowing larger loads to be carried more easily without have to de-palletize or jostle them to lift. An innovation in pallet design, the aluminum pallet can reduce labor and damages to products, while expediting delivery at the same time. Designed for productivity and safety, the aluminum folding stock cart boasts a zero turning radius, sturdy welded construction with a solid integrated deck, and a vertical storage vertical storage footprint that saves space when the delivery truck is empty. The above list of carts, trucks & mobile equipment can help companies increase productivity while reducing stress and workplace injuries. How is your company taking advantage of carts, trucks & mobile equipment for the safe and reliable transport of products?